It seems like every other thing I make these days has tomato in it, is a sauce to go on tomatoes or is simply just a tomato, sliced, with salt on it. It's that time of year and it's almost bittersweet that we're all so overwhelmed with tomatoes right now and that in just one short month, those tomato plants will start to slow down and then stop production. My thought is seize the day. It's all about tomatoes for as long as possible. My one determinate plant has been covered in cherry tomatoes this week and it was time to use a ton of them up before they all dropped to the ground. 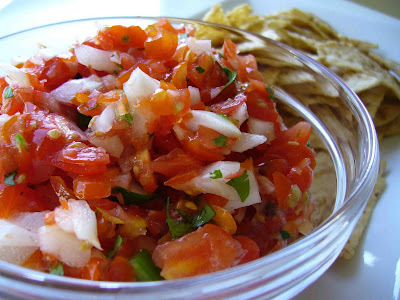 This is a simple salsa that's made my favorite way - quickly and in the food processor. The spice is totally controlled by how many of the jalapeno seeds you leave in so decide how hot you want it and proceed with caution. I make a big batch and serve half with chips, while keeping the rest on hand to serve over chicken or steak. Cut onion into large chunks. Cut jalapeno in half and remove most of the seeds, leaving a few (or more if you prefer more spice). Dice the jalapeno into very small pieces. Remove cilantro leaves from the main stem. Add onion chunks to a food processor fitted with the metal blade, followed by the cilantro, jalapeno and finally the tomatoes. Sprinkle the salt over everything and pulse until very coarsely chopped. Serve with tortilla chips and enjoy! delicioso! wish I had some of this to serve with tonight's fish tacos. Nothing better than fresh tomato salsa ... I always add a squeeze of fresh lime in mine, but then I have a lime tree in the yard .... LOL!